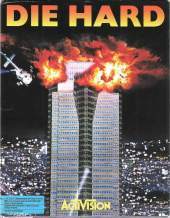 Release Date: 1989 This game is based on the movie Die Hard. It's an early third-person shooter and precursor to Tomb Raider which made that view popular years later. A group of terrorists have taken control of a high rise tower in an attempt to take $600 million. Your job is to rescue your wife who is trapped in the building and stop the terrorists. The game is played with a 3-D point of view allowing you to search the building for useful items and fight terrorists with a variety of weapons or by hand. Cut scenes keep you informed of the plot as it progresses.